The Gualala River is a river on the northern coast of California. Most of the river is in Sonoma County, but a portion is in Mendocino County. The headwaters of the 40-mile-long (64 km) river (measuring via its South Fork) are high in the Coast Range, and it empties into the Pacific Ocean. For its last few miles, it forms the boundary between Sonoma County and Mendocino County. The river has three forks: the South Fork, Wheatfield Fork and the North Fork. 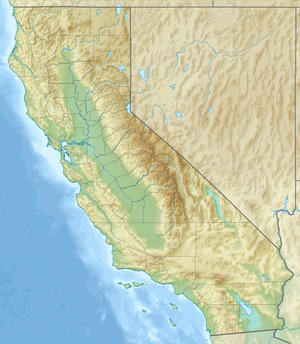 The South Fork is the longest and travels northwest, parallel to the coast along the San Andreas Fault rift zone. The Wheatfield Fork begins west of Lake Sonoma and has the largest flow of the three forks. Its tributaries include Tombs, Wolf, House, Haupt and Fuller creeks. Wheatfield is the first fork to combine with the South Fork. Buckeye Creek, a tributary of the river, joins the South Fork next. It is followed by Rockpile Creek and Big Pepperwod Creek. The North Fork is the only part of the river in Mendocino County. It travels roughly southwest towards the coast along the San Andreas Fault rift zone and meets the South Fork at the border between the counties, a few miles before the river flows into the ocean. The mountainous watershed has an area of about 298 square miles (770 km2), three quarters of it in Sonoma County and one quarter in Mendocino County. Rainfall varies from 38 inches (970 mm) per year at the coast to 70 inches (1,800 mm) inland. The watershed is sparsely populated. Timber production is the predominant land use, historically and currently. Grazing was previously important but has become less prevalent. The river provides recreation, municipal and industrial water supply for the community of Gualala, California, and wildlife habitat including cold freshwater habitat for fish migration and spawning. The most important problem for the watershed is excessive erosion. The area has a high degree of natural erosion because of uplift and displacement caused by the San Andreas Fault, which runs through the area. However, logging and roads have greatly increased the amount of sedimentation in the river. Kelly Road, which runs between Lake Sonoma and Annapolis, is a major source of sediment in the river and its tributaries. High water temperatures is another significant problem. Logging has removed large streamside trees that provided shade and reduced the amount of large woody debris, which creates pools. In 2002, Alaska businessmen and former Reagan administration Interior Department official Ric Davidge announced plans to collect water from the Albion and Gualala rivers in large bags and tow it several hundred miles south to San Diego as drinking water. However, the plan drew local opposition, and was eventually shelved after the state government passed new laws requiring extensive studies of the effects on fish habitats before any such plan could proceed. The governor later signed a law declaring the two rivers as recreational areas, preventing similar attempts at exploiting their resources. ^ McDonnell, Lawrence R. (1962). Rivers of California. San Francisco: Pacific Gas and Electric Company. p. 38. ^ Leavenworth, Stuart (January 30, 2002), "Alaska Firm Wants to Pump Water, Ship It South to San Diego", Sacramento Bee . ^ Locke, Michele (March 1, 2002), "Residents aghast at plan to move water south in big bags", The Daily Courier, Associated Press . ^ Martin, Gretchen (April 5, 2002), "Residents organize against 'water grab'", Mendocino Beacon . ^ Bailey, Eric (March 2, 2002), "Plan to Bag Rivers May Not Float: An entrepreneur's bid to tug giant sacks of fresh North Coast water to San Diego stirs up anger amid the skepticism", Los Angeles Times . ^ Payne, Paul (September 28, 2002), "Davis signs bill to scuttle water export: Fish habitat study would delay plan to tap Albion, Gualala Rivers for San Diego", Santa Rosa Press-Democrat . ^ Wang, Ucilia (December 14, 2002), "Alaskan dumps water bag proposal: Plan to export Gualala, Albion water to Southern California drew heat on North Coast", Santa Rosa Press-Democrat . ^ Flynn, Kathleen (July 30, 2003), "Davis Signs Bill Declaring Rivers as Recreational: The measure would prevent companies from damming, diverting or exporting water from designated areas of the Albion and Gualala", Los Angeles Times . This page was last edited on 10 January 2019, at 19:56 (UTC).